A paper published today in Quaternary Research finds another non-hockey-stick in Tibet, and also finds an inverse relationship between temperature and lake levels on the Tibet plateau. One of many simplistic memes is that "warmer means wetter," since warmer air can hold more water vapor, but this is only one side of the "equation." If warming causes both more evaporation and more precipitation, either of these could dominate to cause a net wetter or drier climate. In the case of this lake in Tibet, increased evaporation dominated over precipitation during warmer periods. According to the authors, the lake levels declined due to increased evaporation dominating during warm summers. The paper joins hundreds of others demonstrating that the hydrological cycle is far more complex than assumed by model simulations, which are unable to directly or skillfully simulate the hydrological cycle/convection/evaporation/clouds/etc and instead rely upon fudge factor "parameterizations" for these critical aspects necessary to skillfully project climate change. Looking at only one side of the equation and ignoring or not fully considering the opposing negative-feedbacks is unfortunately rampant in climate science, including the false assumption that radiative forcing dominates over negative-feedback convection in the troposphere, which in-turn has led to a gross exaggeration of greenhouse warming. Top graph shows another non-hockey-stick temperature reconstruction over the past 17,200 years, with temperatures higher during the Medieval Warm Period ~1100 years ago, Roman Warm Period ~2000 years ago, and during the Holocene Climate Optimum~6000-4000 years ago as compared to the end of the record [left side of graph]. Horizontal axis is thousands of years before the present. Bottom graph shows an inverse relationship between temperature and lake levels over the past 4000 years. We investigate the distribution of archaeal lipids in a 5.8-m-long sedimentary core recovered from Lake Qinghai to extract regional hydroclimate and temperature signals since the last deglaciation for this important region. The paleohydrology was reconstructed from the relative abundance of thaumarchaeol (%thaum) and the archaeol and caldarchaeol ecometric (ACE) index. 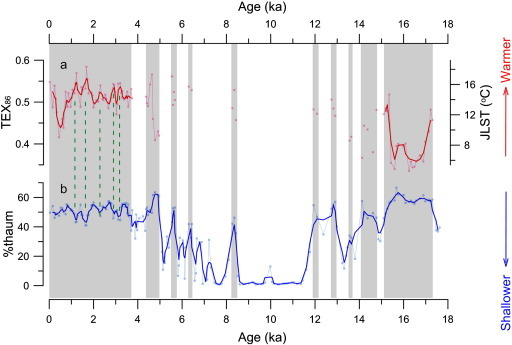 The %thaum-inferred lake-level record was extended to deglaciation, showing three periods (11.9–13.0, 14.1–14.7 and 15.1–17.2 cal ka BP) with relatively higher lake levels than those during the early Holocene. The ACE record demonstrates three periods (10.6–11.2, 13.2–13.4 and 17.4–17.6 cal ka BP) of elevated salinity when the lake was shallow. Filtered TEX86 record based on archaeal lipid distributions corresponded to relatively higher lake levels, implying that a certain lake size is required for using the TEX86 paleothermometer. At 1–4 cal ka BP, the reconstructed temperature fluctuated significantly and correlated negatively with inferred lake level, indicating that lake temperature and hydrological change might be coupled during this period. We attribute this co-variance to the importance of summer temperature in controlling evaporation for this arid/semi-arid region. Moreover, our results indicate that archaeal lipids have potential in reconstructing paleoclimate patterns from lacustrine sedimentary cores, but the data should be interpreted with care. The net outturn from climate variation in any specific location depends on changes in the position of that location in relation to the nearest jet stream track or climate zone boundary. Lakes will lose water if the jets move further away whether that be towards the poles or towards the equator. That is what most affects the relative balance between evaporation and precipitation. I think they could diagnose the current cooling or warming trend and maybe the rate of that trend by ascertaining what the net global latitudinal movement of the jets and climate zones might be over several years or decades but simple global cloudiness as per the Earthshine project would be an adequate proxy I suppose. Refining it beyond that would be almost impossible due to inherent chaotic variability within the system and the fact that meridionally looping jets affect every location differently on all time scales. I'd be happy to help set up and supervise a research project with a few tens of millions of pounds or dollars.